TLJ Daily E-Mail Alert No. 724, August 22, 2003. August 22, 2003, 9:00 AM ET, Alert No. 724. 8/21. The Federal Communications Commission (FCC) released its triennial review order [576 pages in PDF]. This is titled "Report and Order and Order on Remand and Further Notice of Proposed Rulemaking". See especially, Appendix B [HTML], which contains the final rules. This is the proceedings titled "In the Matter of Review of the Section 251 Unbundling Obligations of Incumbent Local Exchange Carriers, Implementation of the Local Competition Provisions of the Telecommunications Act of 1996, and Deployment of Wireline Services Offering Advanced Telecommunications Capability", and numbered CC Docket No. 01-338, CC Docket No. 96-98, and CC Docket No. 98-147. The FCC announced, but did not release, this order six months ago, on February 20, 2003. See, stories titled "FCC Announces UNE Report and Order", "FCC Order Offers Broadband Regulatory Relief", "FCC Announces Decision on Switching", "Commentary: Republicans Split On FCC UNE Order", and "Congressional Reaction To FCC UNE Order" in TLJ Daily E-Mail Alert No. 609, February 21, 2003. Editor's Note: The FCC published this order in the FCC website late on Thursday, August 21. Further coverage of this order will be published in the Monday, August 25 issue of the TLJ Daily E-Mail Alert. 8/18. The National Music Publishers Association (NMPA), representing Jerry Liebler and other music publishers and songwriters, and the Recording Industry Association of America (RIAA) and Motion Picture Association of America (MPAA), representing MGM and other movie and record companies, filed appeal briefs with the U.S. Court of Appeals (9thCir) in Liebler v. Grokster and MGM v. Grokster. 8/21. The Copyright Office (CO) published a notice in the Federal Register describing, and requesting comments on, its proposed rules regarding rates and terms for the use of sound recordings in eligible nonsubscription transmissions made by noncommercial licensees, and for the making of related ephemeral recordings. Comments are due by September 22, 2003. See, Federal Register, August 21, 2003, Vol. 68, No. 162, at Pages 50493 - 50495. 8/21. The Bureau of Industry and Security (BIS), which is also still known as the Bureau of Export Administration (BXA), published a notice in the Federal Register that describes and recites a final rule amending the Export Administration Regulations (EAR). The notice states that this rule amends the EAR "to to add references to the Automated Export System (AES) and to conform the EAR to certain provisions of the Foreign Trade Statistics Regulations (FTSR) including provisions related to AES promulgated on July 17, 2003. It also conforms some terminology in part 758 to that found elsewhere in the EAR and updates references to another government agency to reflect a name change." This rule takes effect on September 22, 2003. See, Federal Register, August 21, 2003, Vol. 68, No. 162, at Pages 50470 - 50474. 8/21. President Bush announced his intent to nominate Michael Gallagher (at left) to be Assistant Secretary of Commerce for Communications and Information. This is the title of the person who heads the Department of Commerce's (DOC) National Telecommunications and Information Administration (NTIA). Nancy Victory resigned from this position on August 15, 2003. Frederick Wentland was named the Acting Assistant Secretary for Communications and Information. Gallagher is currently Deputy Chief of Staff at the DOC. Before that, he was Deputy Assistant Secretary for the NTIA. He has also worked for AirTouch Communications, former Rep. Rick White (R-WA) (who is now CEO of TechNet), and the law firm of Perkins Coie. See, White House release. 8/21. Federal Communications Commission (FCC) Commissioner Kathleen Abernathy released a statement in which she expressed support for the FCC's broadcast localism initiative. On August 20, FCC Chairman Michael Powell announced the initiative, which includes creating a localism task force, issuing a notice of inquiry on localism, and speeding the activation of low power FM stations. Abernathy (at right) stated that "I applaud Chairman Powell for taking positive and substantive steps to ensure that broadcasters continue to further the goal of localism in their communities. Regardless of who owns a station -- a local ``mom and pop´´ or a large media company -- each licensee has an obligation to serve its local community. Recently, concerns have been raised about whether certain practices do indeed serve local interests, and whether the Commission can do more to promote localism in television and radio. Thus, I am pleased that the Commission will consider whether changes in our rules, consistent with First Amendment principles, are appropriate and needed. I look forward to working with the Localism Task Force, my colleagues, public interest groups, and the industry to see how we can together advance this important goal." See also, FCC release [3 pages in PDF], story titled "Powell Announces Localism in Broadcasting Initiative" in TLJ Daily E-Mail Alert No. 722, August 20, 2003, and story titled "Copps Criticizes Powell's Localism in Broadcasting Initiative" in TLJ Daily E-Mail Alert No. 723, August 21, 2003. Meanwhile, the Media Access Project (MAP), stated in a release [PDF] that "Chairman Powell couldn't ignore the public outcry any longer. As a result, he is taking some very welcome steps, none of which offer the slightest reason to change our complete opposition to his June 2 decision decimating the FCC’s media ownership policies." The MAP stated that "We certainly applaud the Chairman's efforts to expedite the creation of more low power FM stations. Now that the Congressionally mandated engineering study has vindicated what low power advocates have said for years, it is high time for the Commission to break up the logjam of existing applications and start the process of expanding the low power service." See also, MAP statement [PDF] on LPFM. The MAP added that "The idea that ownership rules are unrelated to localism is absurd. Companies like Clear Channel and Sinclair Broadcasting have already exploited prior rule changes to eliminate locally originated news programming in favor of fake local newscasts beamed from thousands of miles away." 8/21. Mark Shumaker plead guilty in U.S. District Court (EDVa) to one count of criminal copyright infringement, in violation of 17 U.S.C. §506(a)(1) and 18 U.S.C. §2319 (b)(1), in connection with his distribution over the internet of copyrighted music, movies, software and games. See, Plea Agreement [13 pages in PDF]. The U.S. Attorneys Office (USAO), the Department of Justice's (DOJ) Computer Crimes and Intellectual Property Section (CCIPS), and Shumaker also submitted to the Court a Statement of Facts [6 pages in PDF] which states that Shumaker participated "in the so-called ``warez scene,´´ in particular his membership in the warez group Apocalypse Crew (``APC´´) and his support of the warez group Drink Or Die. APC was a warez organization that specialized in the unauthorized distribution of copyrighted music over the Internet. Among other things, APC sought to acquire digital copies of songs and albums before their commercial release in the United States; these songs or albums would then be distributed by APC members, in MP3 format, to Internet sites worldwide. The supply of such prerelease music was most often provided by music industry insiders, such as radio DJs or employees of music magazine publishers, who frequently receive advance copies of songs prior to their commercial release." The Statement of Facts also recites that Shumaker "performed a number of important functions for APC and was among its core leadership. He operated the group's closed, invite-only IRC channel where members discussed group business and other warez scene activities; he served as a ``site op´´ for several FTP sites, where he and the other APC members had the administrative authority to add and remove authorized users of the site; and he acted as a ``courier´´ for APC, uploading and downloading pirated music, games, software, and movies to and from private warez FTP sites throughout the Internet." Sentencing is scheduled for November 7, 2003. 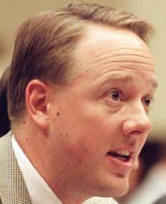 John Malcolm, the Deputy Assistant Attorney General in charge of the CCIPS, stated in a USAO release [PDF] that "The conviction of Mark Shumaker is another example of the Department of Justice's aggressive attack against high-level Internet piracy groups that initiate the illegal distribution of copyrighted works over the Internet ... Music piracy, no less than software or movie piracy, is a crime and its victims are real; musicians deserve to be paid for their creativity and work." Cary Sherman, President of the Recording Industry Association of America (RIAA), stated in a release that "We applaud Attorney General Ashcroft and the Department of Justice's enforcement against Mark Shumaker. The theft of music on the Internet is a serious crime, and this action shows that the Justice Department means business. Those who egregiously distribute music on the Internet should take note -- federal prosecution and jail time are real possibilities." The House is in recess until September 3. Senate is in recess until September 2. The Supreme Court is in recess until October 6. 10:00 AM. Several groups will hold a press briefing regarding the new Computer Assisted Passenger Pre-screening System (CAPPS II). The participants will include James Dempsey (Center for Democracy and Technology), Laura Murphy (ACLU), former Rep. Bob Barr (R-GA), David Keene (American Conservative Union), Grover Norquist (Americans for Tax Reform), and Hilary Shelton (NAACP). Location: Lisagor Room, National Press Club, 529 14th St. NW, 13th Floor.